National Museum of Wales, Cardiff, GB The canvases Monet painted during his sole voyage to Venice, in the fall of 1908, are among the most popular and the best known of his art works. However, their number is relatively small: 37 canvases featuring a dozen different views, taken within short distance of one another. "Although I am enthusiastic about Venice, and though I've started a few canvases, I'm afraid I will only bring back beginnings that will be nothing else but souvenirs for me", Monet wrote to the art seller Gaston Bernheim on October 25. 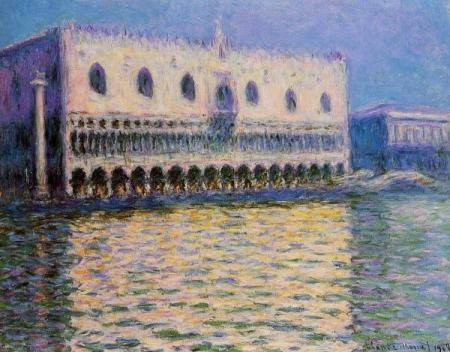 According to Monet himself, the painter did only "trials and beginnings" in Venice. Although the canvases were finished afterwards in studio, they do not have the same impasto as other works Monet had struggled with, like the Rouen Cathedral series. 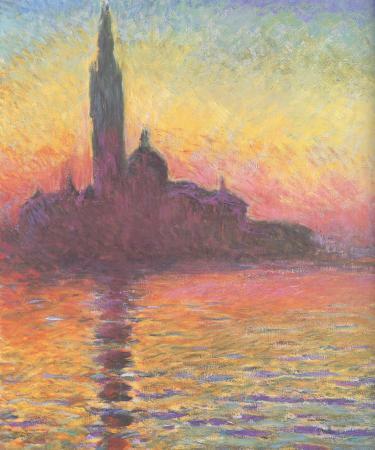 When leaving Giverny, Monet did not know if he would feel like painting in Venice. He may have been reluctant to deal with a subject that others had already painted so many times. In order to feel free to work if he chose, he sent his painting materials ahead. 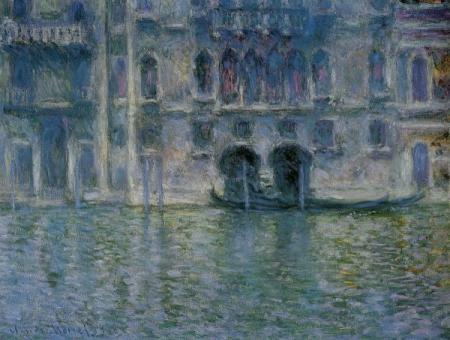 Once he saw the city, Monet was "gripped by Venice". After several days looking for locations, he felt an urge to paint. The suite of Venetian views he realized can be considered somewhat like the pictures a tourist would like to bring home. He set his heart on the well-known landmarks near the Grand Canal -the Doge's Palace and San Giorgio (which could be viewed from his accomodations) or da Mula Palace- or on such typical scenery as Rio de la Salute. Gradually, the sojourn turned into a real painting campaign, just like the many campaigns he had undertaken before. Monet, painter of water and monuments, experienced the shock of encountering a city that unites both. 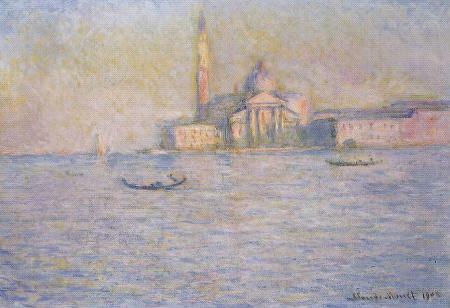 Monet was 68 when he discovered Venice. He had already been in Italy, but not further than Bordighera on the Riviera. The opportunity afforded by an invitation from his English friend Mary Hunter persuaded him to make the trip. He and his wife would stay in the Barbaro Palace on the Grand Canal. The trip filled his wife Alice with joy: Usually they would not stray far from Giverny, where Monet had been exploring the secrets of his water lilies for five years. 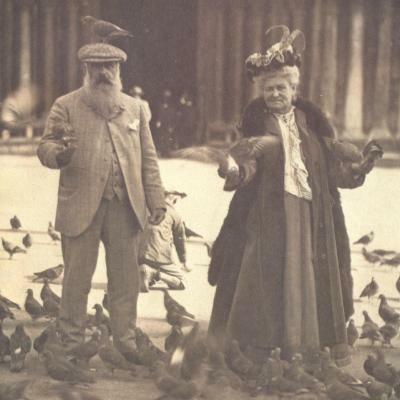 "There were pigeons all over us and I was wincing a bit with fright. But the picture was taken the moment they flew away." Brooklyn Museum, New York, USA Thanks to Alice, we have all the details about their Italian stay, for she wrote daily to her daughter Germaine Salerou. This correspondence was published in 1986 by Germaine Salerou's grandson (Philippe Piguet, Monet et Venise, published by Herscher). 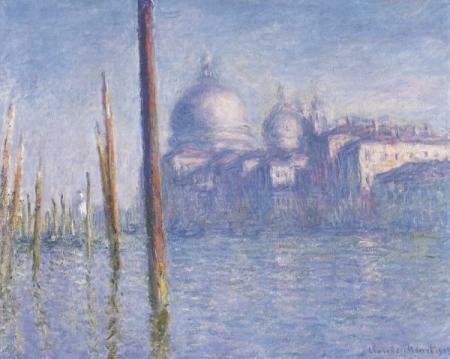 The Monets arrived in Venice by train on October 1, 1908. "It is too beautiful to be painted! It is untranslatable!" Monet exclaimed, lost in admiration. But of course he took up the challenge. As soon as his painting materials arrived and the weather became acceptable, he put himself on work on October 9. His timetable was ruled by the passage of the sun: from 8 a.m. at the first motif, San Giorgio Maggiore, facing St Mark's Square. At ten in St Mark's Square, facing San Giorgio. After lunch, Monet worked on the steps of the Palazzo Barbaro, painting the Palazzo da Mula. At the end of the day, Monet treated himself and Alice to a sunset gondola ride. They were back at 7 p.m.
After welcoming them for two weeks, Mary Hunter was forced to leave Venice. The Monets then settled in the Grand Hotel Britannia, because Monet had "begun to paint marvelous things" under his wife's admiring eyes. Full of enthusiasm thanks to the fine weather, he started new canvases every day. In the morning, the timetable did not change; in the afternoon, Monet painted "on the canal", and after that through the hotel window. "The view out of our window is marvelous. You couldn't dream of anything more beautiful and it is all for Monet", Alice told her daughter. The Monets appreciated the comfort of the hotel and its "electric lighting. It's magic! Monet can see his canvases - it is delicious and makes you wish you had it at home". They would have electricity installed in Giverny upon their return. National Gallery of Art, Washington, USA Several days of rainy, cold, and windy weather enfuriated Monet, relagating him to inactivity. He spoke of leaving and returning the following year; he began to have doubts; he judged his canvases ugly. But when the sun reappeared, Monet soon took up painting again. These ups and downs in his mood would occur several times during his stay in Venice. In spite of these breaks, the work went on, Alice being "happy to see Monet so impassioned, doing such beautiful things, and -between you and me- something other than those same old water lilies." Only cold made Monet give up, in spite of the fur coat kindly lent by Louis Aston Knight, a young American painter living in Rolleboise, near Giverny, whom they happened to met at the hotel. 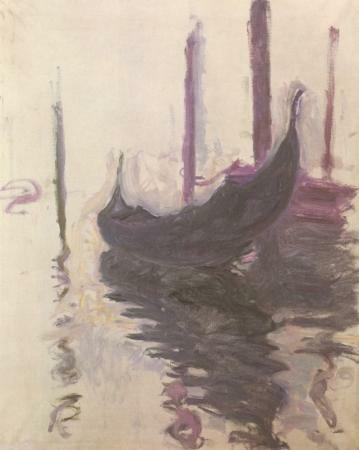 On December 3, Monet painted a final sketch, featuring a gondola. They left on December 7, ten weeks after their arrival, never to return. Alice's health began to fail shortly thereafter, and she died in 1911. Monet would wait a long time before completing the canvases in his studio. In fact, he began to touch them up in November 1910. But he never retouched the last one, the gondola, which he presented his friend Georges Clemenceau. It is now to be seen in the Museum of Fine Arts in Nantes (France). "I had the joy of seeing a large part of your newest works. In front of your "Venice", in front of the admirable interpretation of these motifs I know so well, I felt an emotion that was as complete and as strong as that which I felt in 1879, before your "Stations", your "Streets Decked with Flags", your "Blooming Trees", which motivated my career... A Monet has always moved me. I always drew a lesson from it, and when I was full of doubt and despondency, a Monet was served me as a friend and a guide. These "Venice", (...) I admire them as the highest expression of your art."